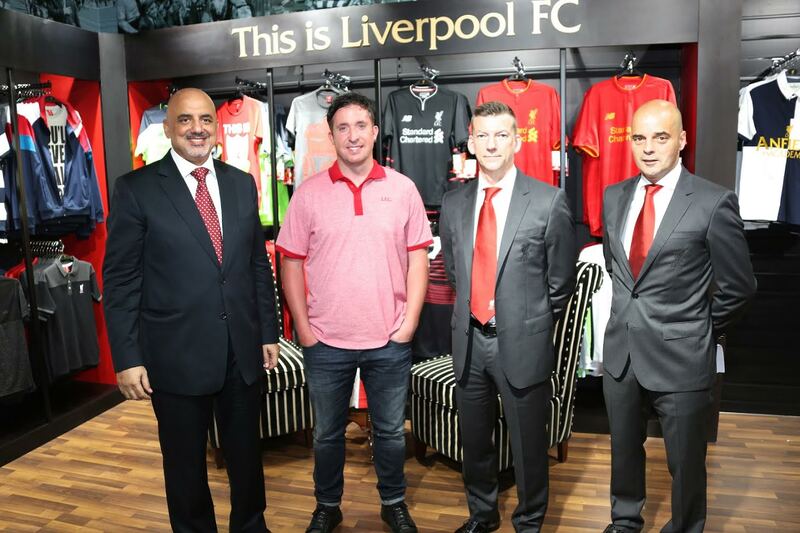 Liverpool FC Ambassador Robbie Fowler last week officially opened LFC’s new Abu Dhabi store in the Al Wahda Mall, meeting the hundreds of fans that turned out for the event from across the Middle East. Robbie Fowler took part in a fan Q&A before cutting a ribbon to officially open the store, which is the Clubs first store in the Middle East and the ninth official standalone LFC retail store globally. Fans were given the opportunity to meet the Liverpool Legend during a signing and photograph session, as well as a replica of the European Cup which was installed outside the store for photographs with fans. Robbie also took part in a special presentation at the event, gifting the Branch Chair of the Abu Dhabi Supporters Club with a certificate confirming their official Supporters Club status. Opening in conjunction with partner Desert Style/ Pioneer Group, the Liverpool FC Abu Dhabi store offers fans across the region access to the full range of New Balance replica kit as well as authentic Liverpool FC merchandise, apparel and fashion accessories. The Club is currently looking to expand its retail operations across the Middle East with a focus to expand into Dubai. Liverpool FC Retail allows fans across the globe to access official LFC merchandise through the Club’s retail and online stores.